Having been in business for over 25 years, Wainwrights have built a tremendous reputation, and since 2013, it has been under new ownership. 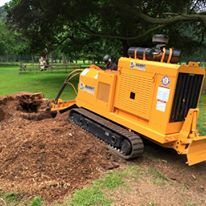 The services we offer include tree surgery, stump grinding and tree planting. Since the purchase, the company has doubled down on its commitment to quality, efficiency, integrity and professionalism. In terms of customers, we have worked with domestic clients, the public sector, other tree surgeons, landscape gardeners, insurance providers and property developers. If you have a garden in Sandbach, tree stump removal can be a great way to improve it aesthetically. We use a variety of state of the art machinery to remove stumps, including the Bandit 2900, the Bandit ZT1844, the FSI D74 & FSI ST 20B. These machines can handle large stumps, and stumps in hard to reach places. Some homeowners prefer to let the stump rot after the tree has been felled. However, the stump can regenerate and shoot out saplings. Stump grinding ensures this will not be the case, and is essential if you plan to have a clean spot where the tree used to be. Once a tree stump removal in Sandbach is completed, the grindings can be either left on site to be used as mulch, which adds nutrients to the soil, or they can be removed and recycled at an additional cost. Tree stump removal can sometimes be a complicated process, especially when the stump has grown in hard to reach areas. This is why if portions of a stump remain above surface after being ground, for whatever reason, we will return to remove them free of charge. Other issues might involve the angle of your garden, or the trees surrounding the stump. The equipment required for grinding is very heavy, which is why we use the smaller, lighter FSI ST 20B for tougher access jobs. If you want to get a quote for your garden, contact Wainwright Stump Removal today. There is no stumping Wainwrights when it comes to stump removal.